(CNN) -- Unseeded Maria Sharapova set up a final meeting with fellow-former world number one Jelena Jankovic at the Pan Pacific Open in Tokyo on Friday, with a hard-fought three-set victory over Agnieszka Radwanska of Poland. 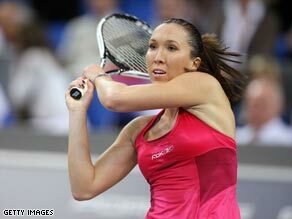 Jelena Jankovic will face Maria Sharapova in the Tokyo final after cruising past China's Na Li. The Russian, who last won a tournament in April last year following a lengthy period out of action because of shoulder surgery, defeated the 11th seed 6-2 2-6 6-4. Former Wimbledon champion Sharapova ground out victory in two hours nine minutes in a match littered with breaks of serve. Sharapova converted nine of her 19 breaks points and her opponent eight of her 10. However, it was the points won on her second serve which proved key for Sharapova, 38 percent to Radwanska's 26 percent. Jankovic, the highest-seeded player left in the tournament at seven, swept past 15th seed Na Li 6-4 6-3 in just under two hours of play. Serb Jankovic saved eight of the 10 break points she faced and converted four of her own, despite Li making an impressive 74 percent of first serves. However, the Chinese player was let down by an unforced error count of more than 40.